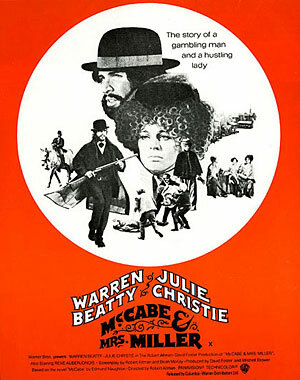 McCabe and Mrs. Miller will screen at TIFF Bell Lightbox with an intro­duc­tion from its cine­ma­to­grapher Vilmos Zsigmond on Friday August 8 at 6:15pm. McCabe and Mrs. Miller (Director: Robert Altman): In Robert Altman’s “revisionist Western,” the smell of sawdust is in the air of Presbyterian Church, an emerging boomtown that’s so new it doesn’t even have a very imaginative name. A man arrives in town and sets up a card game. He seems to have plenty of money and is rumoured to be the gunfighter “Pudgy” McCabe. Soon he’s building a saloon and bringing prostitutes in to work in it. Julie Christie’s mysterious Mrs. Miller soon arrives to tell him he’s doing the brothel thing all wrong, and that she can help. He bends to her strong will, and soon becomes smitten with her. But just as they’re tasting success, and maybe romance, the naked aggression of America’s capitalist system takes notice of them. It’s not hard to see why McCabe does so well as a “businessman” in the town of Presbyterian Church. At the beginning of the film, there’s hardly anything here. Even the church hasn’t been built yet. It’s virgin territory, which makes it a perfect place to start a brothel. Warren Beatty’s McCabe is my favourite type of character, a man whose vanity doesn’t mask his insecurities and lack of intelligence. In fact, it only heightens them. Late in the film, he shows genuine fear, and I found myself hoping he’d somehow talk his way out of things and at least be able to start over yet again somewhere else. These are characters who arrive on the screen fully-formed and yet we are privy to very few of their secrets. Why is Julie Christie “Mrs.” Miller? What happened to her husband? Nobody in this town even asks, the assumption being that everyone is here to reinvent (or maybe just invent) themselves. Vilmos Zsigmond’s gauzy cinematography makes everything seem like it’s being seen behind a scrim. Exteriors are seen through a haze of raindrops or snowflakes, while interiors seem lit by kerosene lamps, with the accompanying smoke. The Leonard Cohen songs on the soundtrack are sometimes a little too insistent, but Zsigmond’s images do a lot of heavy lifting. Late in the film, there are consecutive shots of our two main characters curled up in womb-like spaces that won’t really protect them from the nasty world around them. It also emphasizes their isolation, even from each other. The possibility of real connection in such a lonely landscape comes agonizingly close for our pair, but in the end, everyone is alone. It’s beautifully conveyed, and all the more devastating for it. This entry was posted in Cinematheque, Special Events, Theatrical Release and tagged Robert Altman. Bookmark the permalink.